When Honda Civic left the Indian market in 2012, a true icon of customisation arena sadly had to take a long hiatus. After seven years of absence, the executive sedan has been brought into the country and is priced between Rs. 17.69 lakh and Rs. 22.29 lakh (both prices, ex-showroom pan India). The tenth generation model has been around in the international markets since 2015 and it influenced design cues of Amaze and WR-V. The new Civic has an appealing front fascia with chrome treated grille while the sleek headlamps and bumper enable a wide stance to the D-segment sedan. The heavily raked windshield and coupe-like silhouette add dynamism to the overall package with a rear end comprising of boomerang-shaped LED tail lights. The tenth generation Civic has been available in Pakistan since July 2016 and a YouTuber known for modifications and car accessories has revealed a customised version. Some of the additions were rather interesting. For instance, the thunderbolt or heartbeat style orange indicator flashes positioned at the front and rear bumpers work when the regular turn signals are activated. The video clearly shows the inclusion of a bumper protector and a custom diffuser with dual exhaust outlets on each end. 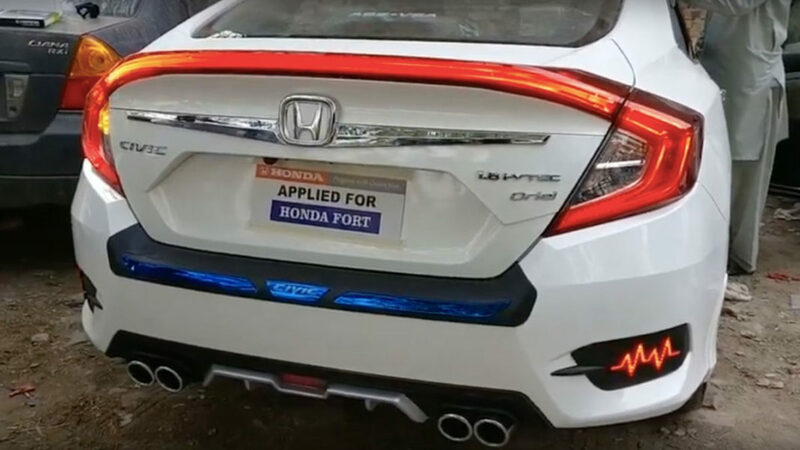 The most highlighting of the features has to be the LED boot spoiler with bolt-on fitting while the chrome garnish surrounding the Honda badge emphasises the premium appeal. Elsewhere, you could find electroplated chrome handles, Type R side moulding, chrome window sills replacing the regular black finish, sill plates with Civic X inscribed on it, contrast dashboard mat, custom armrest cushion. 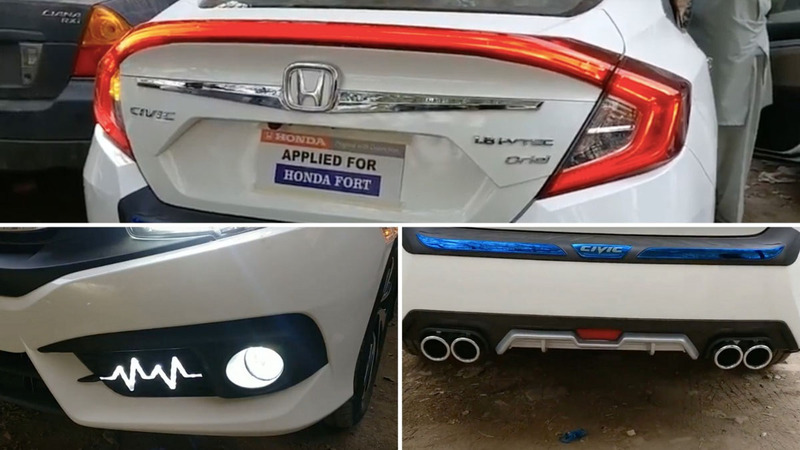 Up front, the YouTuber claims that the new HIDs used are the brightest on any Civic in Pakistan while the bumper lights also have LED technology. In India, the Civic is retailed with several first-in-class technologies like Lane Keep and Agile Handling Assists. It is powered by the 1.8-litre i-VTEC petrol engine producing 141 PS and 174 Nm and is mated to a CVT paddle shifters while the 1.6-litre Earth Dreams diesel develops 120 PS and 300 Nm and is connected to a six-speed manual transmission.